Rawr Lucuma Cacao THIN: the slimmer, pocket-friendly version of Rawr's signature Lucuma Cacao chocolate bar. Smooth, with a sumptuous caramel-like flavour. Naturally sweetened with coconut sugar and lucuma. 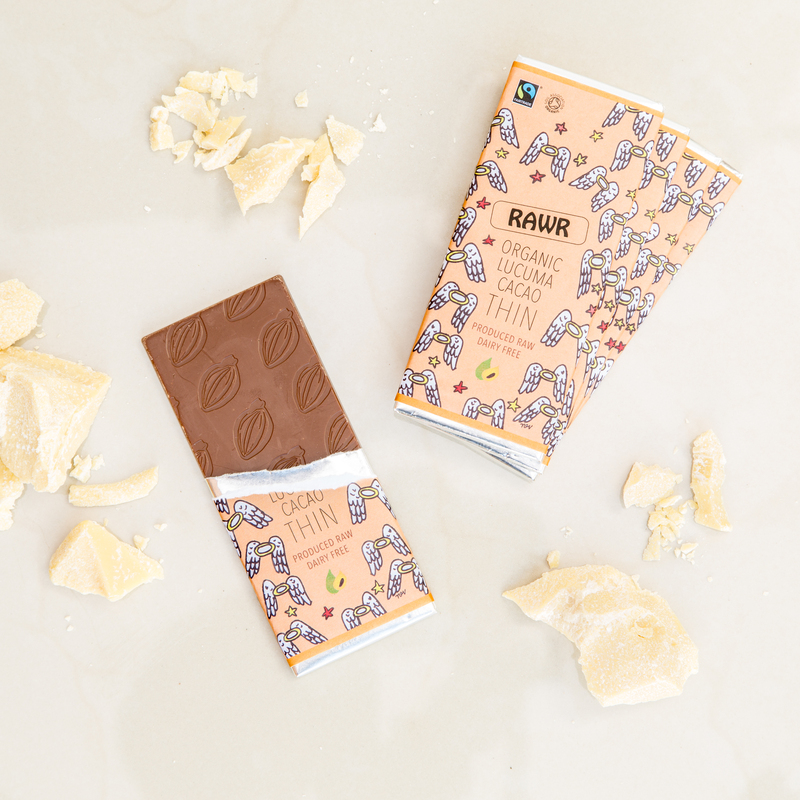 At Rawr we are devoted to making chocolate with the highest quality raw, organic ingredients we can find. Completely dairy-free with no added refined cane or beet sugar, no artificial this or the other, no hydrogenated or chemical preservative nonsense, no emulsifiers, and no colourings. Guilt-free chocolate! Raw, Organic, Fairtrade, Vegan and Dairy Free. Available to buy in a quantity of five x 30g bars. Shelf life: 12 months from manufacture/at least 10 months from dispatch. 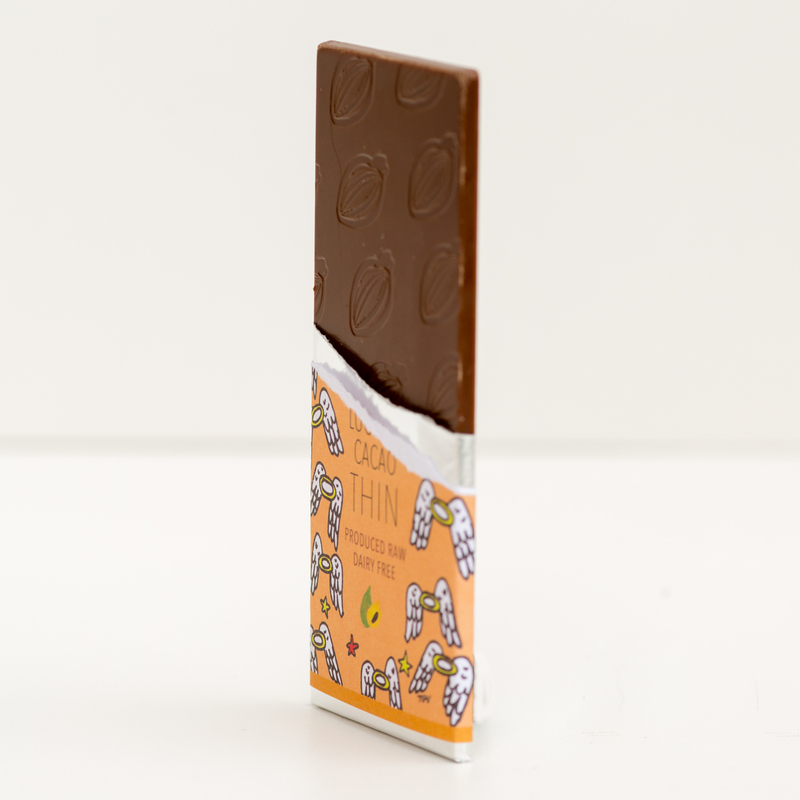 Chocolate bar labels made from 100% recycled paper, including 10% recycled cocoa shell. RAWR chocolate has a wonderful wow moment when you taste all of their chocolate bars and love the packaging - 80% Cacao is a firm favourite but have tried all of the others. Certain healthy chocolate makers made their mark on my life in a positive way and Rawr are one of them. I recently ordered the 5 pack of thin lucuma dark chocolate. I recently ordered the 5 pack of thin lucuma dark chocolate. I wasn’t really a fan of the taste so I returned them and as a good will gesture rawr exchanged the remaining bars for me for the 5 pack including orange and mint. They were much nicer, the taste was delicious, the packaging was beautiful and they feel healthy (; Thanks Rawr! Very quick delivery and well packaged. Awesome! Great delivery was earlier than quoted. Looks professional and inviting. I am gluten and milk free so was nice to find something so extraordinary. Thanks again. Lovely gift material, but ate the first 4 bars bundle myself! Prompt delivery and THE best processed sugar and dairy free chocolate I've tried. Will be making this a regular order. Thank you for the fast efficient service. Thank you for the fast efficient service. My son and daughter (new vegans) were delighted with the chocolate bars. This product is dispatched by Rawr Chocolate. This item has a shipping weight of between 250g and 410g depending on the options selected. Raw, dairy free, fairtrade, organic chocolatey deliciousness.